At the time of the Declaration of Independence it wasn't known what electricity was. A fluid, perhaps? Or a fire? The 1st English edition of Franklin's book "Experiments and Observations on Electricity, made at Philadelphia in America" had been printed in London in 1751. By 1776 it had gone through 5 editions -- 3 in French and at least 1 in German and 1 in Italian. As we said, in the 1750s there was little electrical knowledge. The Greek philosopher Thales, around 600 BC, had said that rubbing amber could -- in dry weather -- enable it to pick up pieces of straw, or pine needles. Also, it was known that two small pieces of rubbed amber repelled each other. The same thing happened with glass. Further, glass and amber seemed to possess some 'opposite' fluid, for they tended to attract each other. Larger bodies could be charged up -- like the charge that builds up in the winter on a woman's silk dress. Many experimenters began to play with bigger and bigger charges, sometimes getting shocks. A large sphere of glass with an axle could be rotated and thus rubbed quite fast, building up a very large charge. Franklin also knew that European experimenters had learned how to store that charge in a jar -- the so-called Leyden jar, devised in the Dutch city of Leyden. He came to his discoveries about lightning rods after he had found in his home experiments that a pointed conductor would discharge an electrified body without actually touching it. [Ref.1,p.130]. This electrical property of a sharp metal point -- to discharge nearby things -- is one of the most important discoveries Franklin ever made, and is profound. 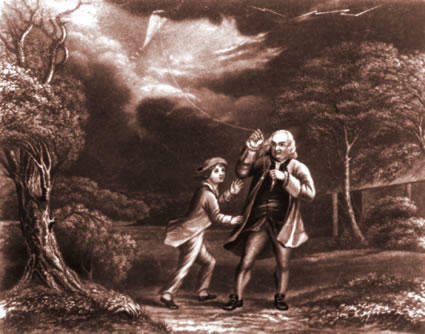 He didn't know for sure that lightning was just electricity, but he went on to perform, with his son, the famous and dangerous kite experiment to clinch the matter. This same experiment had been attempted by the physicist Georg Richmann, in St Petersburg in Russia, in1753, and had killed him. Meanwhile, in London, a Royal Society Commission recommended the use of Franklin's sharp points in lightning conductors, but one of the Commission members dissented, saying that it would be better to use knobs, which were blunter than Franklin's points. The matter became political -- blunt vs sharp -- with King George III later ordering all lightning conductors to be changed to blunt !!! Franklin knew from his home experiments that sharp worked better, but merely said (in a 1777 letter to a friend [Ibid, p.138] )"... Disputes are apt to sour one's temper, and disturb one's quiet. I have no private interest in the reception of my inventions by the world, having never made, nor proposed to make, the least profit by any of them." Finally, after another century of work by experimenters worldwide, it was discovered, just before 1900, that electricity wasn't a fire or a fluid. The basic carrier of electricity turned out to be the tiny electron -- from the Greek word 'ylektron' for amber. 1." Experiments and Observations on Electricity (1774)", by B.Franklin, ed by I.Bernard Cohen; Harvard Univ Press, Cambridge, Massachusetts, 1941. Dr. David Nightingale is Professor Emeritus of Physics at the State University of New York at New Paltz, and is the co-author of the text, A Short Course in General Relativity. A famous American, Harry Selfridge, opened what is now a well-known retail store, Selfridges, in London in 1909. One of his biographers is a professor Linda Woodhead, who earned a double first class honors degree in, of all things, Theology and Religious Studies. She's an expert on Christianity, neo-Hinduism and Islam. Long ago, looking for a particular physics text in a London bookstore, I found, not far from the "P"s for physics and philosophy, a Penguin paperback simply called 'Robert Frost' [Ref.2.]. Browsing through the book, I was completely taken. I really couldn't afford such, from my meager graduate assistantship, but knew I would have to buy it. Let's look at the idea of Energy Independence, and the possibility of no further need for filling the coffers of sometimes unstable fuel-producing nations. When 24 yr old Steinmetz arrived in New York harbor in 1889 he was nearly turned back. His frail and stunted body, his inability to speak English, plus no money, caused the immigration officials to reject him, for fear he might become a "public charge". Fortunately, the friend he had travelled with, who could speak English, assured the officials that he would personally look after him, and cover any debts, adding that Steinmetz had graduated in mathematics at the top of his class, in the Prussian city of Breslau (now part of Poland).